Law enforcement officials said Robert Bowers – a 46-year-old man with a history of making virulently anti-Semitic statements online – was taken into custody after a gun battle with police and is expected to face federal hate crime charges. Authorities described a rampage at the Tree of Life synagogue, the city’s oldest Jewish congregation, that was stunning in its savagery. All 11 people killed were adults, Pittsburgh Public Safety Director Wendell Hissrich said. Six people were also wounded, four of them police officers responding to the gunfire, he said. Witnesses told police Bowers burst into the synagogue shouting anti-Semitic statements and began firing. 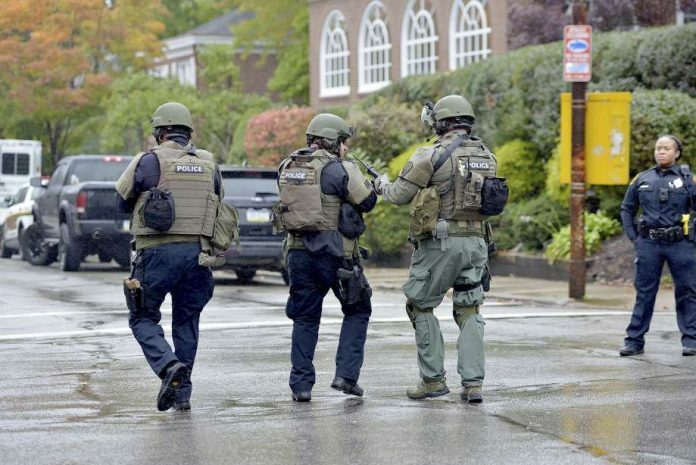 Hissrich said authorities began to receive calls about an active shooter at the synagogue at 9:54 a.m. and officers were dispatched one minute later. Jones said that Bowers entered the synagogue, gunned down 11 people and was leaving when he encountered responding officers. He fired at an officer who was wounded and then went back into the synagogue to hide, Jones said. More officers responded, and after an exchange of gunfire, Bowers was taken to a hospital with multiple gunshot wounds, authorities said. Hissrich declined to say if Bowers was speaking to authorities, and it was not immediately clear if he had an attorney. Bowers appeared to have repeatedly targeted Jewish people using an account on the social media site gab, which is popular with white supremacists and far-right users. Gab deactivated an account under Bowers’s name shortly after the shooting Saturday. Messages posted by the account under his name, recovered before it was deactivated, included white supremacist symbols and anti-Semitic messaging. Recent postings specifically focused on the Hebrew Immigrant Aid Society, known as HIAS, which is one of nine organizations that works with the federal government to resettle refugees in American communities. “HIAS likes to bring invaders in that kill our people. I can’t sit by and watch my people get slaughtered. Screw your optics, I’m going in,” reads a posting on the account that appears to have been published just before the shooting Saturday morning. Mark Hetfield, president and chief executive of HAIS, has no formal relationship with the Tree of Life synagogue, but has helped hundreds of refugees resettle in the Pittsburgh area in recent years. The account that appeared to belong to Bowers was rife with bigoted messaging. His biography on the site read “jews are the children of satan” and his background photo was a radar gun reading “1488,” a popular white supremacist symbol. For weeks, “Robert Bowers” was enraged by the national Jewish group HIAS’s efforts to hold Shabbat services for refugees, according to the archives messages. Earlier Saturday, Trump also suggested that armed security at the synagogue might have prevented the attack. He has regularly suggested that after shooting rampages, even following some high-profile massacres that occurred despite law enforcement officers being present. The violence Saturday — the latest in America’s seemingly unending string of mass shootings at seemingly safe public places — occurred at a synagogue in a leafy residential enclave near Carnegie Mellon University, one of the larger predominantly Jewish neighborhoods in the United States. Its “traditional, progressive and egalitarian” congregation was formed in 1864. It’s the “center of Jewish life on Shabbat morning,” said Rabbi Aaron Bisno of the Rodef Shalom Congregation, two blocks away. It is unclear how many were in the synagogue at the time of the shooting, which occurred at around the time synagogues around the country host regular services for the Shabbat holiday. According to an online calendar, there would have been a Shabbat service scheduled for 9:45 a.m. Saturday. The synagogue’s main sanctuary, a cavernous space with soaring stained-glass windows that depict the story of creation, can hold up to 1,250 guests, according to the Tree of Life’s website. Police in Washington, New York, Chicago and Los Angeles all said they were increasing patrols at synagogues and other houses of worship following the Pittsburgh attack as precautionary measures. The shooting comes during an sharp spike in anti-Semitic activities in the U.S., according to an Anti-Defamation League report released earlier this year. From 2016 to 2017, instances of anti-Semitic harassment, vandalism and assault increased 57 percent, the largest single-year jump since ADL began tracking the data in the 1970s. Ben Opie, 55, who lives across the street from Tree of Life, said his wife was leaving for a volunteer duty at about 11 a.m. when police shouted at her to get back inside the house. Officers banged on neighbors’ doors and told them to stay locked inside. Two hours later, after many of the police vehicles had left the neighborhood, Opie said he’s still shaking. By Saturday afternoon, members of the synagogue were gathering at a grief center waiting to hear about friends and family members caught in the shooting. Stop talking in Shul. This was egalitarian what ever that really mean. Election ploy I hope not. Matzav keep me posted. Remember winter time is usually colder. Open to all…is what it means…not orthodox. A guard would of prevented this. Tree of life , I don’t think so. It’s time we took our own safety at least as seriously as we take our finances. Every shul should have a few dedicated congregants with firearms training, and there should be at least a few gun safes(depending on the square footage of the shul) spread out in few separate well-accessible locations, openned up with the approved congregants’ finger prints. Perhaps only 1 or 2 of these 11 people would have died if they were able to shoot back at the attacker. In fact, they probably wouldn’t have been attacked all together, had the potential attacker known that the potential victims are not a soft target. In 1864, Pittsburgh’s earliest Jewish congregation, Rodef Shalom, formally adopted the reformed American minhag (custom) for its religious services. That same year, several members of the congregation, who were opposed to the reformed services left Rodef Shalom and formed the Etz Hayyim (Tree of Life) Congregation. Chartered in 1865, the small, Orthodox congregation met for several years in temporary spaces, including the home of Gustavus Grafner, the congregation’s first president. A small piece of land in Sharpsburg, Pa., to be used as a cemetery, was acquired by the congregation during its first year. In 1882, the congregation purchased a former Lutheran Church on Fourth and Ross Streets, in Pittsburgh’s downtown, for use as a synagogue. The congregation began to use the English name, Tree of Life. In 1886, the Tree of Life Congregation joined the Jewish Theological Seminary Association, aligning itself with the Conservative Jewish movement. In 1906, the growing congregation laid the cornerstone for a new, larger synagogue on Craft Avenue in Pittsburgh’s Oakland neighborhood. The new synagogue opened in 1907 with seating for 750. Members of the Tree of Life Congregation were active volunteers and supported many Jewish social service efforts. Alexander Fink (1818-1892), president of Tree of Life from 1873 to 1892, founded the Hebrew Benevolent Society and later served as president of the United Hebrew Relief Association. The Tree of Life Sisterhood, founded in 1906, began an volunteer sewing group, donating linens and clothing to local organizations including Montefiore Hospital, where the sewing group was headquartered in later years. Beginning in 1910, the synagogue hosted the meetings and activities of the Young Men’s Hebrew Association, until the group moved to a rented space in the Dispatch Building, downtown, in 1912. At the end of World War II, Pittsburgh’s Jewish community was largely centered in the city’s East End neighborhoods. The congregation began construction for a new synagogue on the corner of Shady and Wilkins Avenues in Pittsburgh’s Squirrel Hill neighborhood where many of its members were now living. In 1946, Charles J. Rosenbloom, president of Tree of Life, donated the land for the synagogue and supplied the cornerstone, made of limestone from Palestine, for the new building. The congregation’s former synagogue on Craft Avenue was purchased by the Pittsburgh Playhouse theater company and renovated into a live theater auditorium, which continues today as the performing arts center of Point Park University. In more recent years, membership to the Tree of Life Congregation has declined due to aging members and growing Jewish suburban communities. Or L’Simcha, a small Conservative congregation, organized about 2007 by a group of people who had previously belonged to Beth Shalom Congregation, began holding religious services in a room in the synagogue. The two congregations merged in 2010 and are now known as the Tree of Life-Or L’Simcha Congregation. The congregation continues to rent unused space in the large synagogue. Currently, Dor Hadash Congregation, a Reconstructionist congregation, holds its religious services and activities there. Did not mean to use the word minhag. This is a piece I found elseware. I do not think it matters now if the victims of this horrific attack had misguided beliefs and by the way, they are in a place which probably we will not merit. time for serious teshuva as one loving nation together. On all levels from frum to frei to Chassidish etc…. And yet we haven’t heard a peep out of the slimy democrat backstabbing Pennsylvania Senator, Bob Casey! He walks in lockstep with his buddies Cory Booker & Kristen Gillibrand and hates Jews like poison. to be truthful -see …on twitter, or just google them! HASHEM YINAKEIM DAMAM!! — MAY THE LORD AVENGE THEIR BLOOD!! YIMACH SHEMO V’ZICHRO!! — MAY HIS NAME AND HIS MEMORY BE OBLITERATED!! 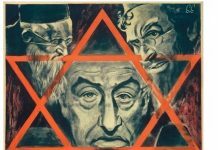 something terrible is happening to our ‘medina shel chesed’. people have lost their minds. shootings, bomb threats, invasions on our borders?! we are too complacent in this golus. perhaps we are being forced to pray harder, with much more kavoneh for the geula. Anyone hear anything from Schumer? Me neither. Waiting for the media and Democraps to blame President Trump for this terrorism event. The chutzpa they have is unreal. They are all preaching violence (“kick ’em when they are low”, “no civility to Republicans”, etc) and then pass the blame to President Trump. Vote Republican in the upcoming elections to send them a strong message. It was the 18th of Cheshvan, the yarzheit of Rabbi Meir Kahane, HY”D. He warned about anti -semitism in the US and the need to protect Jews and make aliyah. 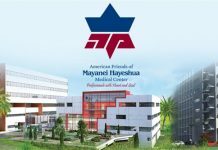 What is the message from shomayim? If correct indeed then are not our sympathies misplaced? Jews were killed because they were Jews. Period. This could have c”v happened anywhere, in any shul including yours. This is a time for achdus not sinas chinam. Acheinu kol bais Yisrael. Hashem sent us a message. You, apparently, didn’t get it. There was supposedly a mishgav zachar event taking place. I see you have a direct phoneline upstairs. Given what you are not-so-subtly implying, please explain why they did not succumb to an illness or accident as most human beings do. Please explain why they were murdered because of being jewish. Someone among them was in their late 90s, can you imagine? And this was done by a sicko who blames Trump for being too soft about immigration (did not seem to blame any of the former POTUS) and in any case, who does he choose to attack? Think about it, tell me if you think it makes the tiniest bit of sense. Whatever the victims said or did has now been wiped out, and if they had been deliberate sinners etc etc (as opposed to misguided and unlearned people) they must have had really huge merits to offset that all. Amazing that this animal was shot multiple times and he is in “fair” condition. If he survives, hopefully there will be a trial and he will get the death penalty – sooner than later. Wow. Just watched the video. Very tough. Didn’t know that information. We are not prophets to attribute cause to what happened. If so, how do you explain the Har Nof massacre where frum Jews were murdered in an orthodox shul? You can’t. The sole message we can all agree with is that we have to do teshuvah and get closer to Hashem and our fellow Jew. Borei olam chose to show his midas hdin on those who openly and proudly are porkei ol. It would behoove all charedim to take the message to heart. What chazal say is with exacting precision. If they teach anyone who is angry is like they idol worship etc… Instead of looking at those who Borei olam punished publicly let’s introspect. Contrast that with the rhetoric from Aderet! Where are the images of what happened inside? If there was a bris reported by the media, why no mention of it on the synagogue,’s website? If there was a bris that the media reported how can it be that only elderly people were killed? Why no reports of interviews of the people who were wounded? I wouldn’t call him a Nazi even-though he Murdered 11 Jews At Pittsburgh Synagogue. Don’t all jump on me at once!!!! Please give me a moment to explain… OK? after all he was sent by Hashem. It’s reported that this terrible tragedy Occurred “During a Bris of Gay Couple’s Twins” (google it and you’ll find it). On top of THAT this so called synagogue is a proud member of “The Union for Reform Judaism” that means that Hashem is not happy with their way of interpreting the holy Torah that WE received on Mount Sinai. In OUR Torah it clearly states that one should not be Gay and they have the Chutzpah to be proud in compromising with the Torah laws? etc. To explain my simple point: the murder occurred because Hashem warned us in His Torah that the punishment for this disgusting deed (of being gay) is “שְׁנֵיהֶם מוֹת יוּמָתוּ דְּמֵיהֶם בָּם”… this Murderer was sent to punish them and as a wake up call, so WE can change for the better in Hashems eyes. So I wouldn’t call him a Nazi even-though he Murdered 11 Jews, because he is simply a messenger from Hashem to wake us up remind us to smell the coffee, understanding that what the Torah writes that the punishment for this low low low act of being gay is to be killed….. One is not allowed to kill people even if they are gay, but once it already happened, looking back we’ll all agree that it’s directly from Hahsem. “מגלגלים זכות על ידי זכאי ו”חובה על ידי חייב” he is a creep, a nasty individual, a Jew hater, a low life, a murderer, I wish him to have the pleasant experience of sitting on the electric chair in the near future. As far as he is concerned his actions are inexcusable!!! My heart goes out to the families of the victims a million times over!!! May all the families who lost their loved-ones in this massacre have a Nechama, “Nebech on them” and may we all wake up and try improving our daily way of life in the true Torah way so we will be Zocha to greet Moshiach very soon. There was a similar bris simcha with gays in Los Angeles and nothing happened. Please look into your crystal ball and let us know. Bad stuff DOES NOT just “happen” by itself and DOES NOT just “happen” for no reason! Rather, it happens ONLY because Hashem makes it happen, and He openly tells us in his Torah that He makes bad stuff happen as punishment and cleansing for us for the bad things that we do. At the same time though, Hashem also tells us in His Torah that He does not always bring the punishment on us right away; He does not always right away have “the lightening strike the sinner down dead.” Rather, He gives us A CHOICE to choose whether to do good or bad, and one of the ways He gives us this choice — that He gives us the temptation to do bad — is that He directs the occurrences of life TO APPEAR like He is not bringing any punishment on the wicked. So, for example, He allows the wicked Toeiva people to appear to live and thrive and make whole communities and even turn much of major cities into big Toeiva enclaves. Severely tragically, much of New York is filled with Toeiva, and, to a large extent, there is no more “Los Angeles” and “San Francisco”; instead, (with all the Toeiva there) it is now “Lost Shamblelous” and “Sham Scam-Sicko”!! Again though, Hashem is doing this to give us a temptation, but He is certainly NOT doing it to say that it is OK!! On the contrary, He is sending us WARNINGS, and more and more warnings, to remind us that it is CERTAINLY NOT OK!! One of the VERY BEST things that the people of the “Tree of Life” congregation can do as a Zeicher L’Illuy Nishmas – as a Memorial for the Elevation of the Souls of the slain people, Hashem Yinakeim Damam – May Hashem Avenge Their Blood, and as a Z’chus – as a Merit for the Refua Sheleima – for the full recovery of the injured people, IS FOR THEM TO TOTALLY STOP THEIR INVOLVEMENT WITH THE TOEIVA THING!! the point is not that they deserved it (though that may be true). The point is – remember you are in galus. remember this is not your land. remember that this is not where you belong. i hope we take this message seriously before it happens to people who are not osek in toevas (rachmana litzlan). Perhaps a different view than R Mordechai Aderet’s, this is R Eiton Feiner. Worthwile to listen to the whole thing, but the vort ends at around 16 minutes and the last 3, he talks about the terror incident and our perspective/reaction. Do you have the names of the 2 wounded Yidden? Do you have the names of the wounded Yidden? Thank you. Besoros Tovos. In this tragic time, it is appalling that we are looking for reasons why this horrific act happened at that specific place and not anywhere else. It is also not a time to assess whether halachically Tree of Life is a shul. The fact is that the ENTIRE WORLD is viewing it as an anti-semitic act. The animal continued to spew that all Jews have to die as Jewish doctors and healthcare personnel were taking care of his gun shot wounds. EVERYONE knows that he did it because of one reason: he feels all Jews have to die. And guess what? Most Gentiles with whom I come into contact have not said a word to me. They don’t care. The only reason why it has made the news is because the media sees it as a venue to blame Trump. Time for cheshbon hanefesh? yes. Time for achdus? yes. Why? Because this is the reaction to tragedy according to Torah values. Also, the goy reminds us that in his eyes it doesn’t matter if you are a kollelnik, black hatter, kippa seruga, no yarmulka – we are all Jews. And guess what? in Hashem’s eyes we are all His children. When people have the chutzpa to trash other Jews with so much hate (including shomrei Torah u’mitzvos who have a different hashkafa), I remind them that Hitler would have shoved them along with the Jews they hate into the same oven. And now Bowers reminds of that again. I am not chas v’shalom saying that all Jews go b’derech haTorah. Unfortunately, they do not. And it is true that in the last 10 years there has been a huge degradation of values in the world around us. This has made its way into our community. However, there is a time and place where to publicly talk against fellow Jews. 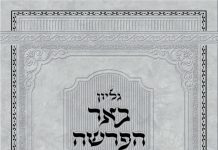 One must ALWAYS think before one speaks – will it cause a chilul Hashem? Goyim who hear that there are those in the Jewish community who feel that the Tree of Life synagogue is not a real synagogue say – well the Jews themselves can’t get along…why should we stand up for them??? Every moment a Yid is either causing a kiddush Hashem or chas v’shalom chilul Hashem. The choice is yours. Chazal teach us that there is no kappara for chilul Hashem. This week the Jews world-wide were delivered a huge blow. We have eleven brothers and sisters who died al-kiddush Hashem. Time for introspection…time for achdus and ahavas chinam…time to speak and act responsibly and remember that we are surrounded by people who are OMDIM ALEINU L’CHALOSEYNU V’HAKADOSH BARUCH HU MATZILEYNU M’YADAM. Let us not be M’HARSEYICH M’MECH YETZEYU…Let us be m’kadesh shem shamayim in our deeds. The choice is yours. May we merit to the ultimate geula speedily. I don’t like the way these apologists for the mishgav zacharniks, mach avek mit the handt the idea of schar vioneish. Yesh din viyesh dayan. All this liberal pc gudeliguk of love love love no matter what avairos chamuros one does, doesn’t work. It didn’t work in Noach’s time. It didn’t work in Avraham’s time with Sodom. It didn’t work for the meraglim. It didn’t work for the chet haegel. It didn’t work by both churban bais hamikdash. To believe otherwise is %100 percent kefira. What’s wrong with you people?